This is the error i am getting since 5 days. Generally, i never get any error when i submit. My last date to submit is 24th and i need this to get resolved immediately. 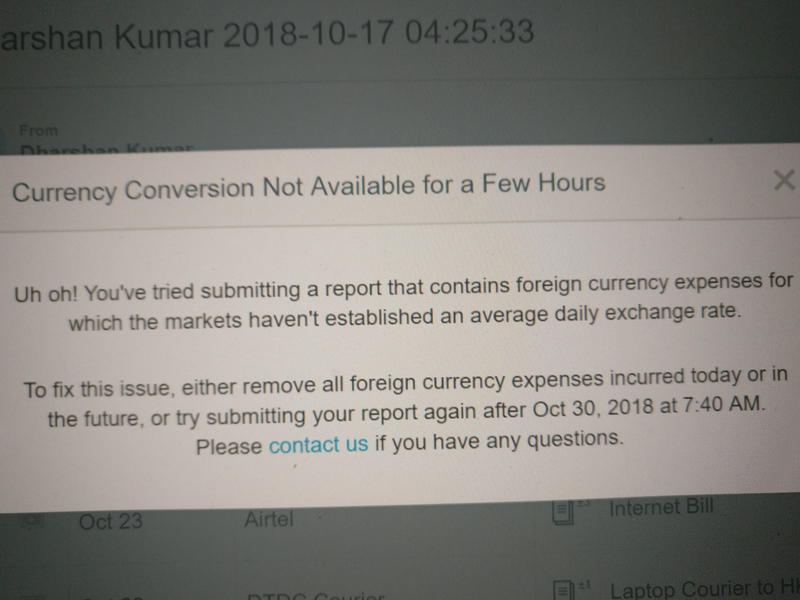 I always enter amount in INR but it gets converted to USD automatically as per the policy. All my attachments are in INR / PDF only. Please help to resolve this immediately. Hi @Dharshan, this error message will only ever appear if you're trying to submit an expense on a report that has not yet occurred. In other words, there will likely be an expense on this report that has a future date on it, sometime after October 23rd. Because we use the FX rate of the day of the expense in order to convert back to the Policy Default Currency, we can't do this until the date has passed. If we knew what exchange rates would be in the future, we definitely wouldn't be in the expense reporting business! Let me know if you need any help in the future! Thanks Ted. I set right and submitted the report.